2017 AGM - "Jane Austen in Paradise: Intimations of Immortality"
JASNA invites you to submit your short film (five minutes or less) to our inaugural Young Filmmakers Contest, part of the 2017 AGM commemorating the 200th anniversary of Jane Austen’s death. 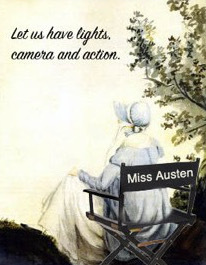 Works must be five minutes or less in duration, shot in widescreen format, submitted as an MP4, and adapted from or inspired by Jane Austen’s writing or life, and relate in some way to the theme “Jane Austen in Paradise.” They may be comedies, dramas or documentaries in live action or animation. They may be modernizations or mashups of Austen and another public domain author. They may be set any time from the Regency era to the present or even in the future. They may be cast with puppets, pets or people. We urge entrants to use their imaginations. The deadline for submission is July 21, 2017. Entry is free. Judges will select up to three winners in each of the three divisions (high school, college and graduate school). A “crowd favorite” award will be bestowed on the favorite submission selected by JASNA members. View the rules and regulations and download an entry form and send to jasnasw@jasnasw.com. Pages Copyright © JASNA Southwest Region. All Rights Reserved.